The toms (or "tom-toms") are small drums (8 to 18'' in diameter) without snare (in opposite to military drums and snare drums) and are generally with a deeper shell than "cases" (but not more than their diameter, and unlike Brazilian surdos and repiniques or African dununs). 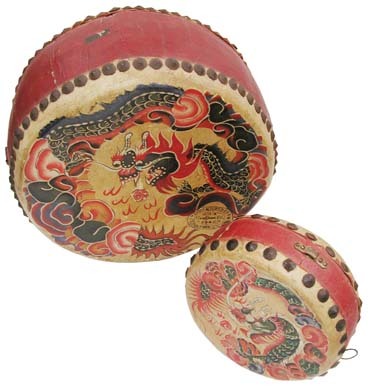 In the very first jazz drumsets (early twentieth century), they were small Chinese drums (drums with skin nailed and rounded shells like barrel (see photo below) and there was generally only one (imported from China), or none). 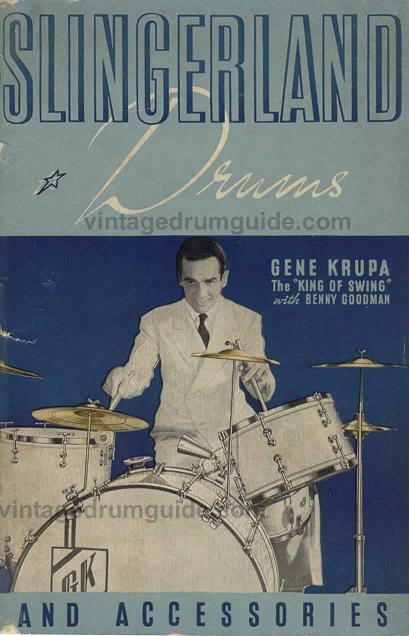 The final version of modern tom (modeled on the American snare drum, with double row of threaded rods and cylindrical shells) is created by the brand Slingerland at the request of the "star" of the modern drummers of the 1930s, Gene Krupa (which played then in the orchestra of Benny Goodman) in 1936 only (Photo below, cover of 1936 Slingerland catalog with first "tunable" toms and Gene Krupa). 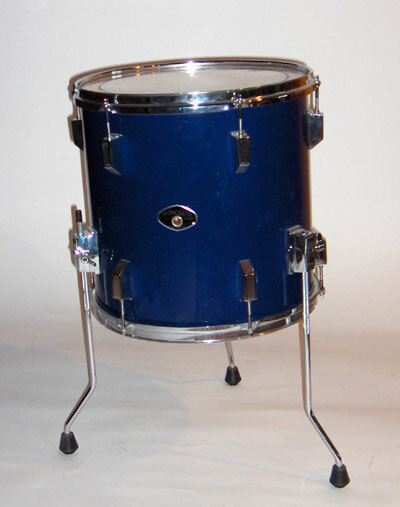 It was quickly adopted by many other drummers and brands, for its convenience to be able to change the skin, but above all for the possibility of tuning the drums to his liking (and probably also its ease of manufacture). 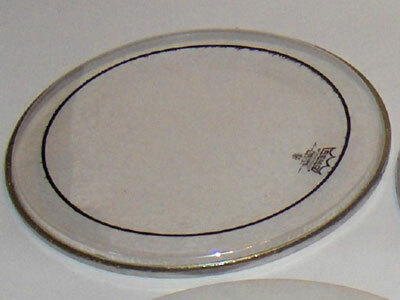 The tom is now also often used in brass bands and symphony orchestras (in contemporary written music). 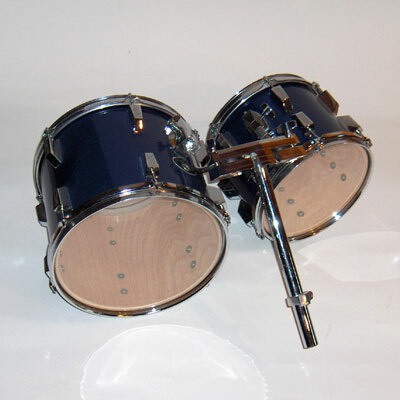 Some drummers remove the resonant skin to dry the sound and purify the tone (give a clearer fundamental tone), as for the bass drum. 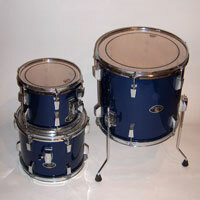 Toms were also designed on this principle called "concert toms" (for contemporary written music at first). Hal Blaine , great studio drummer of American pop music of the 1960s, was the first drummer to use a drum kit with a large number of toms (with concert toms) with 10 of them. 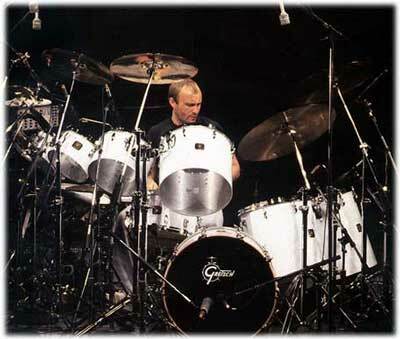 Nicko Mc Brain of Iron Maiden and Phil Collins (photo below) have used them instead of double skin drums a time also (9 toms for Nicko, 6 for Phil). The "toms going down" ("descente de toms" in French) is a typical figure of rock and jazz that is to make a continuous single stroke roll passing from one neighbor tom to another (generally positioned from left to right, from smallest to largest). The natural movement of hands for a binary single stroke rolls, allows to pass at each binary number of notes on a right tom, without crossing the arms (if you start the signle stroke roll on the first beat with the right hand, example: R1L1R1L1R2L2R2L2 (R = Right hand, L = Left hand, 1 = tom 1 (high placed on the left), 2 = tom 2 (low on the right)). 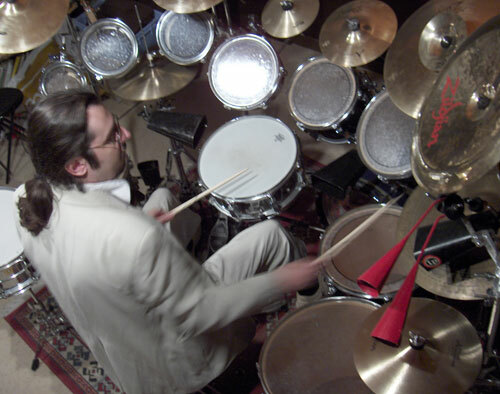 Drummers like Max Roach , Jack DeJohnette , Dave Weckl or Terry Bozzio play real melodies on their set of toms (they also tune their toms as string instruments, by refering to their fundamental tone, the most audible, and by choosing scales). Many jazz drummers play only a minimal set of two toms (one suspended above the bass drum and a floor tom on legs, on the right of the right leg, like Bill Stewart , recently, for example). 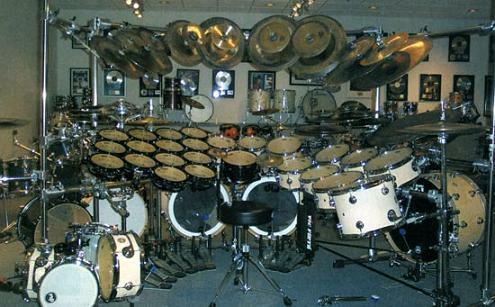 The standard kit is with 3 toms (two suspended and a floor tom), as found in rehearsal studios and on the market, but can be up to 24 to my knowledge (new set (2004) of Terry Bozzio with three staggered rows for the smaller (14 "piccolo toms" chromatically tuned on the left and 10 diatonically on the right (see photo above)!)). There is in fact for real limit only the size of the toms and the length of the arms! Many fusion (jazz-rock, jazz-funk) drummers play or played with 5 toms, 3 suspended and two floor toms, or vice versa (Tony Williams , Dave Weckl , Dennis Chambers , for example). 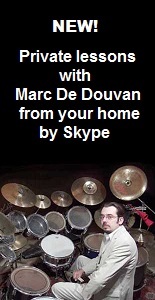 To help you to create a personalized drum set, I invite you to visit my lesson "Conceiving your drum set" , with photos of 10 exemplary sets with historical (drummers using a similar set) and technical (advantages and disadvantages) commentaries. The toms are suspended by various modes of fasteners (or "clamp") described in the "fasteners" chapter. They are either fastened to the top of the bass drum, by a tube that crosses over it, either on cymbal stands, isolated stand or on a "rack" (stand with 4 legs which supports all the suspended instruments). The low toms (or "floor toms") have additional shells for receiving three legs terminated by rubber endings. By sliding the legs and tightening them with a side screw, you can adjust the height and tilt of the tom. In rock and fusion styles, the toms usually have a more "round" sound than the snare drum to create contrast and accentuate the effect of "breaks" ("breaks" in the composition, the melody, called aso "fills" because arrangers don't write them generally and just write "fill" above an empty shaft). Their wider depth and the lack of snare naturally give them this characteristic, but it can be enhanced by the adjustment and the type of skin. By relaxing the skin as possible (there should be no folds) you enlarge vibration amplitude of the skin, making it more low, powerful, round and resonant, but less controllable for the stick rebound. If we can bring closer the fundamental tones of the two skin of a drum, they will resonate in sympathy but also in "resonance", which will give a more accurate tone but also an amplification of their vibrations (like someone always pushing a children swing at the right time, when it reaches its peak). This setting is difficult because the striking skins are generally different and thicker than resonance skins (one is made to resist to the shocks of sticks, the other is more sensitive to respond to air movements). See my lesson "How to tension your drum skins" for more information about how to properly tighten the drumheads with explanatory diagrams. The skins of toms can gain roundness and dullness through the system of double skin like the famous Pinstripe (Remo, photo) with a unique system of gluing of one skin on the other (delimited by a black circle).